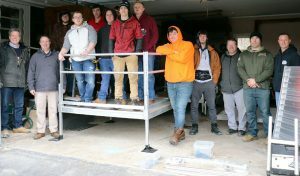 MEXICO – Construction Technology students from the Center for Instruction, Technology and Innovation have once again teamed up with the ARISE Oswego County Ramp program to build ramps for local residents, helping them gain mobility to come and go from their homes with ease. CiTi Construction Technology students assist in building a ramp in the town of Oswego as part of the Oswego County Ramp Program through ARISE. Pictured from left, CiTi Business Education Liaison Garrette Weiss, Construction Technology teacher Craig Mahon, several students in the Construction Technology class, ARISE Housing Advocate/Ramp Coordinator Scott Pecoy, Specialist Stanley Tyrrell and Staff Sergeant Christopher Denman from the U.S. Army National Guard. The Oswego County Ramp Program has impacted the lives of many individuals returning home after rehabilitation, upholding the sense of freedom in being able to get out of the house and be a part of the community, which makes the program an indispensable service for many residents. “I like that this is a hands-on project that gives me experience to hopefully work in the construction industry someday,” said Construction Technology student Shane DeMott. Staff Sergeant Christopher Denman and Specialist Stanley Tyrrell of the U.S. Army National Guard have also assisted in the ramp building efforts, becoming mentors for the students. “Any way we can help, whether it is helping to build parts or pieces or tearing down existing ramps, we are always looking to provide support to the students and to help our community,” said Denman. CiTi Construction Technology instructor Craig Mahon said that the students not only get the chance to work collaboratively for a great cause, but also learn about Standards of Accessible Design associated with the Americans with Disabilities Act; knowledge that will be extremely valuable for future careers in the field of construction.